Grey is the colour of the moment. Whether you are searching for the right interior or exterior colour, grey inspiration is everywhere. A grey exterior is a classic choice. The designer’s secret weapon though has always been this beautiful neutral. In the past, grey has been a much maligned colour, however it is in fact one of the best neutrals to use in an exterior palette. At some point grey has always been used on at least one substrate on a house, whether it is a simple slate roof tile that brings much understated elegance to a scheme or an architect’s colour choice for windows. A grey exterior has always been a winner and ensures that house colour palettes come together well. One of the best features of grey, apart from being a sophisticated neutral, is that it goes so well with fresh white. A white trim with grey, whether it is used inside or outside, really elevates the colour to another level. 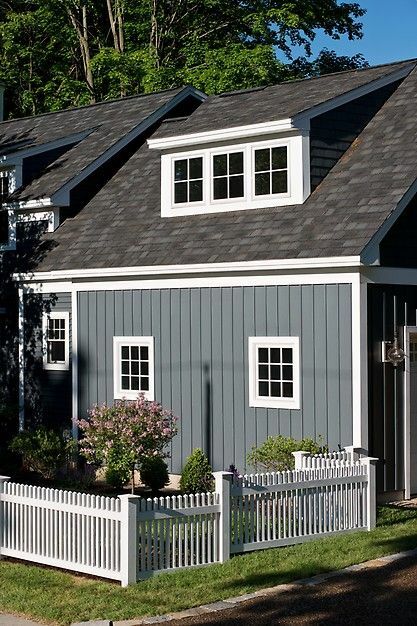 The grey shingle roof, partnered with a mid-blue grey for the walls and fresh white trim makes this a beautiful house – well I think so! It really is a simple colour palette and gives you a very upmarket look. Don’t forget the mantra with colour palettes, that less is often more. This grey exterior palette highlights the vertical weatherboards, gorgeous shingle roof and interesting windows with their generous architraves. These are all great architectural elements that speak for themselves and don’t necessarily need additional colours. This is another example of a blue grey exterior with white trim for a project that I undertook recently. The owners use this little lakeside cottage as a weekender so didn’t want anything too fancy. The poor cottage desperately looked to be in need of some TLC but really all it needed were a few minor repairs and a simple colour palette to update the look. It really is amazing what a simple paint transformation can achieve. I introduced a darker grey on the foundation bricks to ground the house and provide a look of some substance. The colours I used were Dulux Dark Door, Dulux Rangitikei River and Dulux Whisper White. It’s interesting to see on a sunny day how much this house appears to be blue. This is a point you must never underestimate for a grey exterior, that the sunlight will wash out the neutral and you will be left with the underlying colour. Not a problem of course, you just need to be aware of the effect. The above house is another example of a grey exterior with white trim for a house. This example is from Haymes Paints using their colours, Sense and Greyology 1. I particularly love their Greyology palette as it goes from 1 to 7 in various tonal stages – great for interiors but also useful too for a grey exterior palette where you need a couple of different lighter trims. Always look out for paint companies that offer their neutral range in various tonal stages as this is a foolproof way to partner neutrals to ensure you select colours with the same undertone. Talking about undertones, this is actually the main point that you need to take away from this article. All greys, as with all neutrals, including white, will have an undertone of colour. The grey exterior colours shown so far all have a blue undertone. Buy a sample pot of your chosen grey and paint a large piece of card with two coats. View outside in all conditions; morning, evening, a dull day and in bright sunshine. View on different aspects of your house – the grey will appear different on the north to the south aspect. This is when you will see the underlying colour and gain an appreciation for how this will look on the exterior of your house. Repeat the process for your chosen trim colour to see how they appear together. The house below has a grey with a warm purple undertone. This colour looks great on contemporary houses, particularly smaller urban developments. You will however love it or hate it so you need to be sure when you select a grey for your house that it is the right one. A grey exterior that has a purple undertone also looks very effective on federation houses that have terracotta roofs with hints of purple in the tile. Select a grey with a purple undertone for guttering and fascia on these homes and you can’t go wrong. Consider too if you have brick on your house as you will often see a purple undertone here too and this is another time when a grey exterior trim like this will work well. You’re not really adding purple to your house scheme, just the right grey to complement the architectural features that are already there. The cottage below has a lovely neutral grey which doesn’t have too much blue or purple. These are often the greys that have a touch of brown and are much sought after at the moment. I like Dulux Timeless Grey – a great neutral for an exterior scheme. Although a neutral grey exterior is timeless, the neutrality in it can leave the look a bit flat so don’t be afraid to add a splash of colour. This can be very effective on a front door, which is a great place to inject some personality and flair. The sharp cool, yellow green shown here really lifts the colour palette and brings a touch of fun to the scheme. This image below uses a palette of very warm greys. These are the lovely brown grey neutrals that will stand the test of times and give you a very classic house. The different substrates on this house offer the opportunity to use the same grey but in varying strengths which is very effective when offset with white. The use of a warm grey exterior palette ensures that the house is sophisticated and contemporary, yet welcoming. I think in fact that this is one of the most timeless looks, in terms of colour, and will ensure that your house looks as good in ten years time as it does today. The colour that you choose to paint the eaves can be dictated by the gutters and fascia or by the grey exterior wall colour. Although I love a fresh white trim on a grey house, I prefer slightly darker eaves that relate well to the grey on the walls. They may still appear just white as they will be a very pale grey and outside this will wash out. My main point is that you need to consider this carefully as part of an overall grey exterior scheme. So, whether you want a simple grey and white palette, some colour in the mix or a palette of various different tones of grey, you can see that this is a very sophisticated and user-friendly neutral that will ensure you have an exterior colour scheme that will be enduring. Follow my Pinterest board for lots more examples of neutral exteriors and don’t forget to join the conversation and let me know about your decorating and colour dilemmas. First and foremost though – don’t forget to look at exterior colour schemes outside, in sunlight, on a large expanse before committing to a scheme. A little legwork goes a long way! Your blog is great. We are currently trying to select a grey for the exterior of our new two storey – for the fascia (flat roof), small sections of Axon panelling, and garage door. We wanted a charcoal. We have spotted gum cladding as a main feature, plus large steel structure in ferrodor natural grey that has a corten rusty steel laser-cut screen in it. There’s also rendered white wall. Plus a floor to ceiling thin Bowral blue brick wall. Sound a lot when you list it like this! We were looking at Dulux Domino and Klavier. Domino seemed seemed quite a flat grey in the sunlight. We were slightly leaning towards Klavier as this was darker, but some people see purple. I can’t see it, but am worried we will see it more over a large surface. Are there any other dark greys you would recommend? Also we were thinking Lexicon for the white wall, but see that it matches better with Domino. If we went with Klavier, could you recommend a white that is still very white? We also saw your advice on full, 1/2 and 1/4 for interior walls/skirting etc. Is there a guideline for (render) walls and eaves for exteriors. Any advice much appreciated! Thank you so much for your advice. It was greatly appreciated. I am really struggling to get the right grey for the exterior. There were 2 I loved, now I have seen a 3rd. My 1st choice was Silkwork- full or half? And now I like shale grey. I want a light grey with no blue & possibly surfmist for roofing..thoughts would be fantastic. Hi Samantha, we have chosen Silkwort for our exterior, we are going with lexicon for the white trims, but still can not decide on a roof colour. Would surfmist be too light? Thinking shale grey may be too matchy? Or do we forget the light colours and go with a dark roof? We are re painting our house shortly and would like your advice. Our house is two storey with render at the bottom and vertical cladding at the top. We have Colorbond Jasper for the garage door, skillion roof, gutters, fascias and feature panels. The house faces East and sits high above the road. Hi Samantha, Would you recommend using Surfmist Half Strength for a rendered exterior of modern two storey with White Birch Window frames. Roof, trim, verandah railings and fencing are all Surfmist, but exterior paving and tiling is sandstone colour. Also thinking of using Flooded Gum on some exterior rendered retaining walls. Should we go white exterior walls or a light neutral grey or greige? Keep swinging between a light grey and white which I love but dont know if cream windows will be too obvious with white. If we go white I want it to match Surfmist roof rather than be a mismatch of whites so am reluctant to look at other warmer whites. Hi Samantha, Your blog is amazing! Such a great reference for my choice of house colours. I am about to start painting my exterior, it’s a little old fibro cottage in the Perth hills, nothing fancy, but plenty of character. I decided on Dulux linseed with whisper white trim (It has a red roof which wont change). I am now having second thoughts, thinking linseed might be a bit green. Do you think I should go for something like flooded gum instead? It’s seems to be a bit more brown I think. Thanks for an incredible blog! Thank you for providing such great advice regarding exterior colour choices. We are building a very modern style two story house with a grand entrance. The ground floor external will be rendered while the first floor will be a James Hardie Matrix panelling. I am thinking of Dulux Tranquil Retreat for all of these walls with monument grey windows. The entrance will be the feature and at this stage will be covered in James Hardie woodgrain panelling. It will have mid/dark-grey marble tiles (800mm x 800mm) on one side of the external entrance next to the front door, going up to about 3 metres in height. The colour of the woodgrain panelling has left me a little confused……I’m not sure whether to paint it in a cedar colour, or keep with the grey tones? And secondly, I am wondering if the Dulux tranquil retreat will be too light to use externally? Thank you in advance for your expert help! Would you be able to tell me what the colours are in the James Hardie home. I love the greys and brown combination. It looks beachy, just what I want. Thanks Samantha. I have engaged a Dulux colour consultant two months ago and she suggested Dulux Bogart and Dulux Heifer to me because I have the Colorbond Jasper. I prefer the grey/Browns and because my house is similar to the Hardies one I was steering more towards something like that. I think I am going to go with either Dulux Malay Grey or Stepney for the dark and Dukux Silkwort for the light. I have Colorbond Jasper as a vertical feature near the centre of my home covering both floors as well and the lawn and garden are about 4 metres to the front. I wish I could send you a photo for your opinion? Thanks for all your help and I love reading everything on your site. I have a small weatherboard home that is undergoing a major overhaul. I have a new roof in Surf Mist. Windows and doors are in matching colour. I was looking at Evening Haze as the exterior wall colour but it is much more grey than I had anticipated and in the areas that receive little direct sun the colour is quite dull . Colour cards from various paint brands seem to indicate that Evening Haze has a different base to what the actual colour has. I am keen to have a colour that is closer to what the colour cards represent and was wondering if you would have any suggestions as to what colour would more closely match the colour cards. The paint chart that I am looking at is an Accent Colorbond one. I have recently purchased a small federation minors cottage in a gun barrel style… I have no idea what colour to paint it…It is on a small block and front verandah is right up to front picket fence… I would like to paint it different to all the greys around at the moment… I like greys but the neighbours are greys, whites and creams… I’m in a real quandary as to which way to go… I can send a pic if ok..
Any idea what paint colours the 7th image down from the top would be? The James Hardie picture with the facade that has the rendered garage and scyon weatherboards. The bottom floor has a nice warm grey and goes well with the lighter grey on the top floor. Thanks for taking the time to offer so much advice on your blog – there is so much to learn when choosing paints! 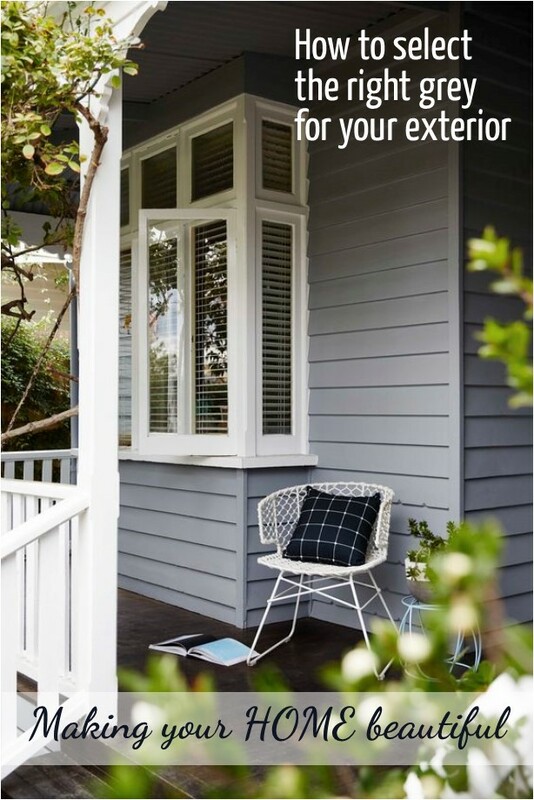 We are choosing exterior paint for our renovation of a weatherboard house. We’ve used a Colorbond Shale Grey roof and gutters, and Surfmist fascia. We’ve been toying with using Shale Grey on the exterior walls as well with window trims in either Surfmist or vivid white (after reading your post about whites I thought Surfmist might be better in our harsh sunlight). We have ironbark timber feature posts and a natural timber front door. We are situated in Central Qld so harsh sunlight, and lots of it, is our reality. What are your thoughts on this? I’ve painted the weatherboard on each side of the house with the Shale grey and I like it but don’t want it to be too purple. Also, if I used Surfmist on the exterior trims would you paint the soffits the same colour? I too am deciding on exterior colours & need some help. I have decided on a colourbond shale grey roof & gutters & colourbond s urfmist facias. I also plan to do the windows & trim in a vivid white. I have tried sample pots in shale grey & half strength shale grey for the main house colour. I feel the full strength shale grey is too grey for me but do you think the half strength will look too washed out? Thanks for this wonderful blog! I’ve just been reading the comments here and saw that colours look darker when painted on weatherboard, and have a question for you. Our about to be painted house has a rendered exterior with large gable ends, which are weatherboards (south facing) sitting over the top of a surfmist garage door. I was going to paint the render and the weather boards the same colour grey (I’m on my sixth sample pot and everything makes the surfmist look cream). The rear of the house has a second story in weatherboard and I had planned to paint it half strength surfmist or Casper white. Should I paint the weatherboards on the gable ends the same as the rear of the house or the render colour to not clash with the surfmist door? Any suggestions would be much appreciated. Hi Samantha. I am in colour hell, please help! I am renovating a 1930 federation home that is tuckpointed red brick at the bottom with top half rendered, roof is dark grey tile. I have added a large exterior wall which has a large expanse of solid wall and then wall and pickets at the front, it is a corner block. I had my heart set on a dark wall as I will have a pool and deck run alongside and from inside that would look great but I am concerned that it will be too much from the street, look too bold. If I do go ahead with a dark colour I was thinking of Monument to match in with new gutters, I do like Woodland Grey but I have heard it can look greenish in full sun. If I do go ahead with a dark wall what colour would you suggest for the house and the pickets? What colours would complement Monument and red brick without looking cold? Want to keep some warmth without going beige. I am considering the change to a light colour for the exterior wall however everything I look at my husband says it will just look like concrete. I also need to take into account that I am using a coloured render so it will probably look darker again. Thanks so much for sharing your experience with colour seletions in your blog – so helpful. We are renovating a 1990’s WA coastal home in a modern Australian hamptons/coastal style,and it has a 25 year old roof which is currently appearing closest to Dune in colour. I couldn’t see any posts regarding mid strength grey/brown render colours to suit Dune on the roof and with a suitable shade of white on the gutters and fascia, plus some cladding, and white windows and front door, and a double and single roller door in light or white colour. We also have a rendered wall across the front which we would like in a slightly darker colour to the house render (but they can’t be too dark as we are coastal and fading will be an issue. 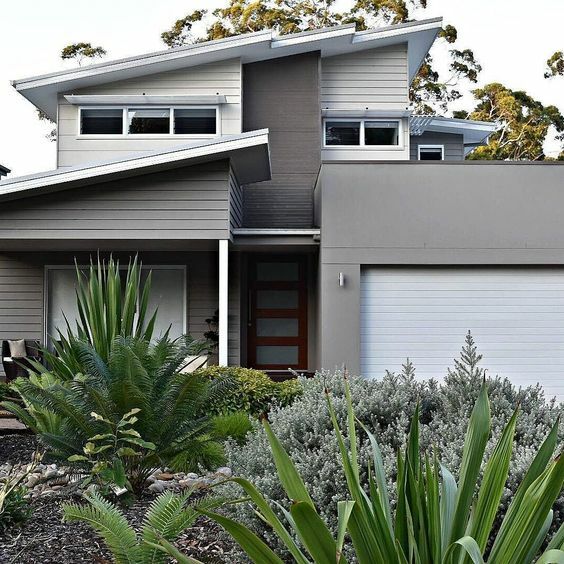 I haven’t seen too many warm grey roof colours like Dune with white gutters and fascias in Australian design trends (apart from surfmist on surfmist which is very common) but a few examples in US designs. We would really appreciate your suggestions on some render colours for the house and front wall, plus the idea of a white gutter and fascia, and the shade of white we could consider – would like visit white on windows and trims and cladding. We also gave 4 cladding filled triangle barge board featured which will need a colour also. Reckless grey was too dark and I like powered rock and flooded gum but not sure on the best shade of warm grey to suit Dune. We are building and fairly confused – hope you can help. The house is a tri level and from the front you will see the street level and half of the upper level as the block slopes back from the street. The street level will be rendered and the upper level will be board. We have chosen Colourbond Basalt for the roof, guttering, fascia, windows and garage door. We will have some timber around the front entrance and door. A colour consultant recommended Dulux Ghosting but it looks very light. We saw a house we liked and it is done in Dulux Rakea – it looks great on the house but the sample looks really dark and a bit brown – is it too dark? We are currently renting and the internal colour is Dulux Grey Pebble Half – it’s beautiful and we are considering for the internal walls. Will Grey Pebble full strength be too light for outside? Many Thanks in advance. I have been reading your forum for some months and the advice is great – now it is decision time!! Thanks so much Samantha – will check out Mangaweka. In the mean time we have had a paint shop recommend Haymes Pale Mushroom 4. Looks good but again not sure if too light! Our front facade will face South West. Thank you once more for your reply – just one more quick question and I think I might have used up my time! Do you think there will be enough contrast between Dulux Rakaia and Basalt windows? We sometimes see houses that look a little washed out with too much grey. With Basalt roof and garage what colour would look best if we render our entrance columns a different colour (they have timber posts at the top). That’s 2 questions – sorry. 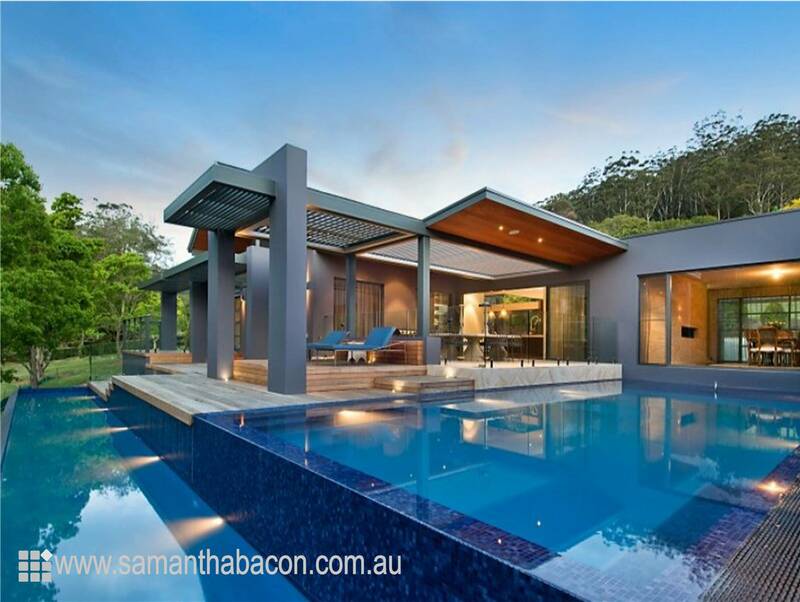 I love the colour palatte of the James Hardie contemporary home above on your blog. We are building a similar home at in the bush with a similar garden. Could you give me some ideas of the Dulux greys that would be similar? Is it Basalt colour bond Roof with surf mist white and a flooded grey wall colour? or more warm greys with woodland grey Roof and Dune wall colour and surf mist white… So confused which greys to use in the bush with a north facing sunny block. 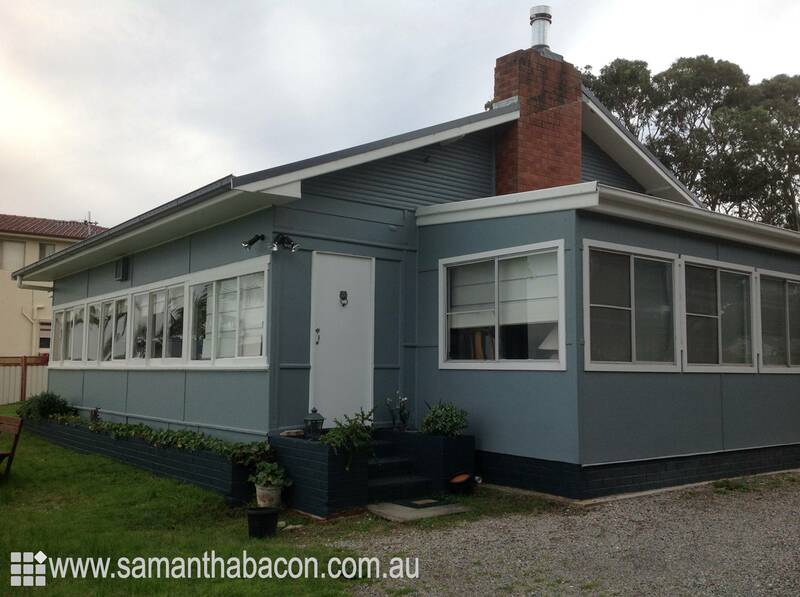 I really like the James hardie picture’s colours but unsure which greys/ white it all is? Maybe you can help me. We are looking to render our house and am pretty much in the light grey/white sort of camp. House is flat roof (shale grey colorbond but you cannot see it) with monument fascias and gutters. All windows and doors are cedar or aussie hardwood stained a teak colour, so dark natural wood. Orientation is important in all three directions. North is primarily taken up by big bifold doors and a timber deck but gets lots of sun. East is almost double story due to slope of block but gets lots of sun. West is main frontage and faces street but gets good shade from trees and large ridge. Fence is woodland grey miniscreen profile. I have considered shale grey (colorbond colour) and like milton moon, tranquil retreat and timeless grey in dulux colours although i think the latter may be too dark. Essentially what do you think would work with monument roof and lots of natural timber that is in the neutral grey sort of area? Happy to hear if you believe I should be rethinking my palet. We are building a house with a surfmist scillian roof , basalt gutters and facias and window and door trims Trend Anodic Natural. We have James Hardie Summit profile cladding. Our preferred colour for the exterior is grey, however none of the greys I have tried look right. Can you please suggest any colour combinations that might suit this house. We have an 1880’s weatherboard house with a colourbond roof in Headland red. We have to work with the roof colour, but we’d like to update the exterior to grey with white trims. Considering the red roof, would you be inclined to go with a lighter grey like Dulux Dieskau/Flooded Gum, or a darker grey like Dulux Malay Grey/Teahouse? Thanks! I absolutely love your blog and the advice that you give. I have been reading your articles for awhile and thought I’d be brave and ask for some of your help please. We have a pale orange 90’s brick house with colonial/french style windows and doors. The front of our house faces East and our main living/entertaining area faces North. Last year we had our terracotta coloured roof sprayed in Monument and our double garage doors too. I really would love to render our house with a ‘greige’ or grey colour. I do love the ‘Hamptons’ look of grey and white trims but I also love the look of a warm, stone-grey with dark trims. I am struggling to choose between the two and therefore not too sure of the best ‘grey’/greige to choose for either of the looks. I love Dulux Rakaia, Colourbond Shale Grey and Porters Old Stone wall for render colours. Could you please advise me on a suitable dark trim colour and which grey would possibly work. Or would the classic grey and white be suitable? Just not sure which grey to use. I am happy for other colour recommendations too. My wife and I will be building a new home later this year, and whilst googling for external colour inspiration for our rendered styrocrete dwelling i stumbled across this blog, and its been amazingly helpful. We are comfortable with most of our selections (monier ‘traditional’ concrete roof tiles, sambuca in colour, monument guttering, surfmist fascia, window frames and doors) However, we are stuck on the main wall colour and feature portico. Whilst we want a light, fresh neutral grey, we are also desperate to avoid the home appearing blue or purple. We first agreed on Dulux Milton Moon, however, after reading the comments section im concerned this will throw a blue colour in sunlight. Im now leaning towards Dulux Silkwort. What is your opinion on the perfect neutral grey to march our other colours? Additionally, i should mention for the portico feature colour we have currently chosen Colorbond Woodland Grey, and intend to install colourbond fencing along our boundaries of the same colour. I am curious to hear your thoughts on this idea too! Thank you for your response. I appreciate your tip with Porter’s Old Stone Wall. I have been devouring over grey houses with white trims (gutters/fascia/windows) and those with the grey trims too, and personally think that white trims do present with such a classic and timeless look. I think that would possibly be the look that I want. Your blog and replies to comments have been very helpful, I am building a new single storey house with a momument roof, fascia, gutter and garage door, white aluminium windows, a large Merbau feature entry door with glass, light/medium grey exposed agg driveway and I am stuck on what render to pick for either side of the garage (two small sections) and one pillar. I am thinking shale grey but am worried it may look blue colour, can you provide any advice on this? Also if you have any comments on my other selections that would be helpful, thank you. Or maybe Timeless grey for the trim? Thank you so much Samantha, it helps a lot to know that they go together. Now we have the freedom to decide which ones we like the best! Have chosen “timeless grey” with “monument” but still can’t decide on lighter colour. Should I use “lexicon half” or “vivid white” is there something else you think. We are building a new house and need some assistance with exterior colours. House windows will be anodic silver and roof monument. I was thinking two grey colou is for the walls. Can you recommend Anything that would go with this. I would really LOVE (actually, I really need) your help. We want to paint our bedroom walls and rest of house with a light and bright and pale grey (we think) but so many have tints of lavender or fluro green in them (ick). We have two feature walls in lounge rooms painted Dulux – Stepney, and book cases in those lounge rooms painted Dulux – Western Myall. We accessorise with bright stark whites, a touch of red cushions or red vases. What do you recommend for the walls? We have painted the external cladding of our house in British Paints Dark Silhouette. Louvre windows and sliding doors around the house are in Colorbond Monument. Roof, gutters, eaves and downpipes are all Colorbond Windspray. We have a pergola off the front deck that is painted white. We are struggling to decide what colour to paint the external architraves around the windows and doors. Everyone is saying white, but we are thinking either Monument, same as the windows and doors, or Dark Silhouette, same as the cladding. I’ve really enjoyed reading this post but it’s making me question my decisions…! Hi Samantha, I’m loving your blog and desperate for your help. I have tried several sample pots on the wall but none of them seem right! I am about to paint a profile AC sheet cladding beach house, receiving lots of sunlight. The house is split level with a large balcony from the upstairs area . I have decided on monument fascias etc and was wanting pale grey walls with white windows. Could you please suggest a pale grey that won’t look blue at all? I really need help with my exterior. I have chosen delux wildove but it looks more purple. I am planning to go with another grey. Please advice me on that. Roof is charcoal. Like most I am struggling with render colours, I am building a 2 story house and thinking about rendering it Lexicon but not sure 1/4 or 1/2, do you think a 1/4 will look more like vivid white. I would like my house to look nice and crisp white but not stark white. I have a large pillar in the front which I’m thinking of Woodland Grey and a Woodland Grey garage door. The roof with be dark tiled with Monument gutters and facia, and down pipes Surfmist. I also have like a hardiplank feature in the front below my tiles which I will paint to match the stain on the front door. We are renovating and extending our coastal home, and I thought I had decided my exterior colours… but now having some doubts! It is such a big decision. So would you mind if I run them by you please? Roof and gutters – Windspray; Fascia – Surfmist; Window frames, trims, balustrades (ship style picket) – all white… I was thinking Shale Grey for the Linea and render… but I’ve only really seen Shale Grey on weather boards. Would it look ok rendered? And will this colour complement Windspray? I am hoping all the white trims and balustrades will assist with breaking up all the large amounts of grey. I’ve always been keen to have grey with white. I really appreciate your feedback. Hi Samantha, Just wondering if you could help on some house exterior colours please. It is a homestead style house with verandha. Would love neutral beige tone colour for walls and white poles and window trim. Roof is maybe Cove? Unsure what to paint gutter as not so sure about white gutters. Presently it is painted a yellow cream with antique red gutters and poles. I just cam across your informative blog while looking for information on a grey exterior colour. We are in the process of renovating an old single storey home. 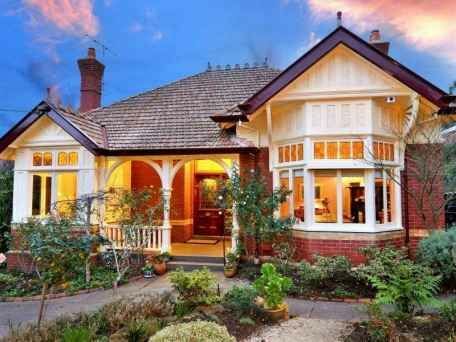 It’s 100 years old, has a beautiful sandstone foundation and a terracotta coloured tiled roof. The house itself is double brick and has been rendered. We would like to modernise it with a grey exterior. However, we don’t want to go too light, but not too dark either, perhaps somewhere in between. Your point about sunlight washing out the neutral and leaving you with the underlying colour is really interesting. And for that reason I’m hoping to steer from any greys with purples or blue tinges. Is Timeless grey a great exterior on rendered homes? Not too dark, not too light? Does it off shoot a purple or blue? I have seen some photos of homes in this colour, they do vary depending on the house. I don’t want the house to look dark and gloomy, but modern with street appeal. I am leaning towards white window frames (which should look lovely with the white plantation shutters) and then a contrasting colour (possibly grey) for the eaves and fascia etc That tone of grey I’m not sure about! Anyway, any advice you could give on a lovely grey combo would be appreciate and save me migraines ha! Hi Samantha, grey blog. I’m trying to pick a colour for the render of my townhouse. It has a steel roof and I’ve decided that the front door, garage and trim will be in Woodland Grey but now need to pick a colour for the render! There is also a red brick facade as well. At the moment, I’m trying to pick between Windspray, Timeless Grey or Shale Grey for the render. What are your thoughts on those 3 options? Thank you! Your blog has been the most helpful in narrowing down our colour choice for our new roof. We are replacing our brown tiled roof with colorbond. Our house is a 70’s split level (looks 2 storey from the front) in the Perth hills, the roof colours we have narrowed it down to is Windspray, Wallaby and Basalt but I am still too scared to commit to a colour! The window frames will be painted the same colour as the roof and the house will be painted in a light grey. We will also be adding cedar cladding to 2 sections where the brick is currently painted a reddish brown. I really would like a neutral grey, I don’t want it to look blue/grey or beige/grey. I hope that makes sense! The house faces North. Can you offer any advise? I have a double storey house and I am getting a new roof colour including the gutter and fascia to basalt. I want to repaint the house in greys and like the tranquil retreat and whites. However my window frames are a creamy/beige colour so not sure white around the windows and verandah will work? I am really stuck, any way to show you a pic of the house. Would love some feedback. We are looking to modernise the paint scheme on an Edwardian weatherboard which has been extended with double garage. The roof is surfmist and the garage doors (and front door) are Colourbond deep ocean. Looking for a mid-grey to work with the deep ocean while making it more modern (currently the colour of sand). I thought I had previously published this post so apologies if its coming through twice! We are building a home at the moment and I’m hoping to gauge your thoughts on our exterior colours. The home is a modern coastal look with white render (Lexicon – half or full strength) and Scyon linear cladding in grey (we are thinking Dulux Tranquil Retreat or Taubmans Stormy Shaddow half strength). The roof and fascias are Shale Grey Matt and eaves either white also. Could you let me know if you think those selections will work well together? Samantha what a treasure trove of hints and advice in these comments! My question is related to your last comment. We have a 40’s ranch style weatherboard – south facing – that I have (I think) decided to paint Pale Mushroom 6 (-50%). Being south facing the 6 was pretty dark, but we have a red brick fence and chimney, so 5 seemed insipid alongside that. Ergh. Anyway, I am stuck on a Colorbond roof colour. Woodland Grey works well, but the roof pitch is steep, so there’s a lot of roof and it is so dark! I was wondering what you thought of a Shale grey roof, Pale Mushroom 5 1/2 with Whisper White trim and a Woodland Grey gutter to demarcate the two? Or is that mental and I should just stick to Woodland Grey roof and cope? Many thanks if you get time to read this! Hi Samantha, i love your blog and having problems with the Greys so was hoping you can help me with your expertise. I have a 1920’s weather board cottage with original tin roof that i’m hoping to paint a soft light grey together with white trim and monument gutters & doors to keep her quaint yet timeless. The problem is she’s south facing, the front facade is in constant shade and the house neighbouring is olive green, the other white with Woodland Grey fences. I’ve tried tranquil retreat (which is probably the best at this stage), shale grey 1/2 & 1/4, dieskau, silkwort, narrow neck, grey pebble even ghosting and knowing, none suit as the shadow amplifies the purples and blue base, the beige based look odd with the olive house next door. Being based in rural north west nsw is making it hard to access samples and help. I was hoping perhaps you have come across this before and had some recommendations? So many great colour combinations that people are choosing. I’m currently painting the exterior of our house and am struggling with finding the right colour combination for my taste. We have a 1917 weatherboard house with a terracotta tile roof, and a very modern box extension for the back. I’m thinking of painting the weatherboards Dulux Milton Moon, and the eaves, gable and window panes Dulux Vivid White. The extension part of the house will be Deluxe Domino. My concern is that the Milton Moon will look too blue and washed out. 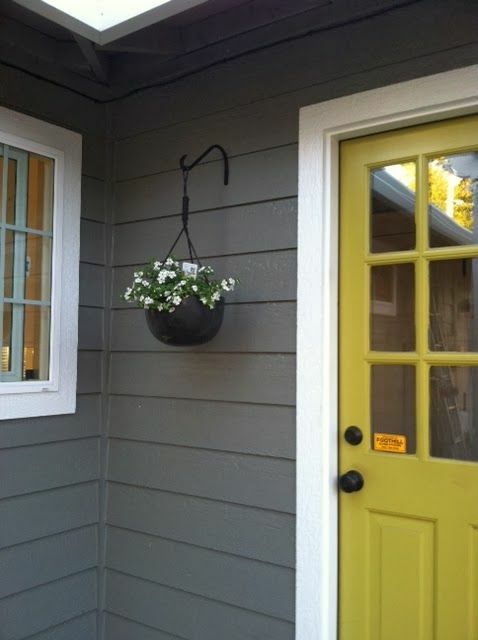 Would you bring some of the Domino colour into the front part of the house? The front and side fence will be domino also (it’s a corner house). Absolutely love the blog on the ‘greys’!! I am known for my inability to choose a paint colour and the family joke how many sample pots I purchase before i get the correct colour lol. For the outside render of the new house I have narrowed down the main colour to Tranquil Retreat and was thinking Lexicon for the contrast. I would appreciate your opinion for these two colours as you have mentioned that Lexicon throws up a little blue, and i think that Tranquil Retreat is more of the green undertones. We are embarking on a new build, modern coastal cottage style. We have an existing granny flat at the front of our property which we need to blend with. The granny flat has a Colorbond roof in Ironstone. We don’t like the existing exterior paint colour so will repaint at the same time as the new house. Which colour would you recommend to go with the Ironstone? I would like something with a bit of warmth to it, not really cold grey. Also debating whether to paint the granny flat the same colour as the main house or a variation thereof. Would appreiate your expert thoughts! PS – And by the way thank you for so painlessly answering everyone’s questions here! Our house is in need of a refresh, but I am struggling with what colour to go with. It is a 70s brick with a Manor Red colourbond roof, gutters and downpipes, front gates (into a courtyard) garage door and pergola. So much red! The bricks have flecks of grey, some look a light red and some even a pinky colour. It’s probably not as bad as it sounds, the bricks are just very busy with no one colour! The house faces west, we are the low side of the street and surrounded by a reserve, so not a lot of sun, especially during the cooler months. My husband is not keen to paint the gutters and down pipes, so it would be just the other bits. It was suggested to go with warm greys e.g Dune. I would so appreciate your thoughts, your blog is so enlightening! I am building a single story 29 sq house. Advise me for my facade colour scheme selection. My roof is Bristile Heritage granite, gutter – colorbond Monument, Fascia – colorbond surfmist, front render – dulux winter castle, front window – colorbond wallaby, facade pillars(piers)- Dulux Hammer grey, Garage door/Cladding over pillars/main door – chestnut stain. Thank you Samantha for the reply, I will have a look at Baltica. Some of the grey flecks/blobs are like a burnt charcoal, would Basalt work? I have a sample pot of Baltica and really like it. I did forget to ask, if I am using this colour on fascia boards, what would be a light complimentary colour with Baltica for under the eaves. Thank you so much for your advise Samantha, really appreciate it. Hi Samantha, I just love your blog! I would greatly appreciate some advice on a render colour. We are building and have selected a monument roof and gutters with surfmist fascia and windows. Our bricks are a darkish cool grey. We have a rendered feature wall in the centre (its a wide acreage design home) with 3 narrow windows. I was feeling I need to go lighter as a contast to all the grey bricks and was leaning toward surfmist render. But am concerned the surfmist window frames will blend. Could you recommend a cool grey that is as light as possible that will still allow the surfmist windows to pop a little? Was thinking shale grey? Thanks very much Samantha, appreciate your assistance. It’s a big decision to do something different so now I am more confident in my choices. Thanks for your contined blog posts – your advice is always spot on! We’re about to finalise the exterior render paint choice on our red brick (tuckpointed) federation house that also has terracotta roof tiles. Based on the sample pots I’m 99% sure will go with Dulux Grey Pail and then Dulux Lexicon Half for the trim, gables & window frames. We are also keen to try a front door painted in Dulux Black Gloss. Thanks Samantha – I really appreciate your input. Thank you for all the valuable information posted here. And house faces north/west….thanks again !! I would love your thoughts about the colour palette our Dulux colour consultant has chosen for our 100 year old Californian bungalow. The home sits on greyish/golden sandstone (needs a good gurney) and it takes up about 1/3 of the front of the house, which has made choosing the right external colour difficult for me. I told the consultant that I wanted a grey exterior, but she thought that true greys wouldn’t complement the sandstone. She chose Dulux Powered Rock for the exterior, Casper White 1/4 for the window trimmings and battons and Monument for the capping and gutters. On paper, the palette looks lovely. But I wasn’t sure if I loved the Powered Rock enough. For me, it didn’t seem grey enough. So I painted a large piece of cardboard in Powered Rock and placed it on a variety of spots around the house. The results were quite deceiving…at the front part of the house the colour looked more grey, which i liked, but on other parts of the house it looked more taupe grey so I was left very confused. The painter is starting work next week so I’m in a panic…I just dont know how Powered Rock will look, I’m afraid it may look dull or shockingly ugly!! Have you seen Powered Rock on any external home?? I can’t seem to find any photos of it used on a house, which also concerns me. What do you think of the colour palette she has chosen? Is powered rock light or dark on a large scale? It’s Yve again. So sorry to bombard you…I’m just continuing from my previous comment/question. I tried a sample of Flooded gum and placed it on the house near the Powered rock sample. Powered rock definitely looks more ‘brown’ next to the Flooded gum. Unfortunately, my hubby doesn’t like flooded gum because he thinks it’s too blue and there is no contrast with the monument painted gutters.. I do agree with him on that. The painters are starting to prep the walls, but so far have only painted the old gutters. Monument gave the gutters a new lease of life, they look fabulous and brand new!!! I’m very happy with that choice. I know what I want for the house exterior- a mid (not too dark, not too light) GREY, that doesn’t shoot off too much blue. I need it to contrast the white window trim, white posts and battons and the Monument gutters. At this point I was thinking of trying ‘Tranquil Retreat, Shale grey and possibly Silkwort- Dulux. Am I on the right track??! The house doesn’t get too much morning sun for long, it’s shaded for most part of the day… The back of the house gets a lot of afternoon sun tho- very bright and searing!! However, the back of the house will have stacker doors so I’m not as concerned as I am with the front of the house.. I am so glad I stumbled across your blog. We are renovating our house and deciding on an external paint colour has been so much trickier than anticipated. Our roof is ironstone and windows surfmist. I’m finding the bluey/purple tone in ironstone challenging to match. I originally picked a ressene colour , half gravel which clashed and have since painted patches in stone drab, winter grey and space capsule. I’ve not been happy with the greys so have moved away from those and painted patches of beige royal and dune. Dune looks good in the shade but we have large areas in the sun and I’m not sure about Dune in the Sun. Any advice would be appreciated. We are building a new house and just about ready to paint our weatherboards Miller Mood. We have a Basalt colorbond on the skillion roof and Surfmist gutters, fascia’s, garage door and window trims. The majority of the house which is rendered is being done in Surfmist half strength. After reading a lot of your threads, I am concerned the Miller Mood might be too blue. The front of the house faces SSE. We are very overwhelmed by choices of colour! Your suggestions would be invaluable at this stage if the game! Your blog is great and very informative. We have a weatherboard home that I would like to repaint. Currently zinc alume roof, cream walls and red gutter and sills. Have looked at surfmist for verandah posts and facia with ??? Wallaby gutters and sills still deciding. Our issue is we have windows, lots of them in the primrose cream colour that we can’t change. I have looked at dune but find it too purple, we put shale grey up which looked very blue initially, we have also tried winter fog not sure if it is too dark but that has less blue and then tranquil retreat!!! Feeling slightly overwhelmed. Any suggestions. Thanks Samantha for your reply. Do you have any earthy grey colour suggestions we can try. We are going to do some more test colours on the house. Hi Samantha, We have PGH espresso bricks, monument roof fascia, gutter. We have linea weatherboard in parts to break up the espresso brick – it’s a large home. We have a colourbond shed – and wanted a light grey to paint the weatherboard. It makes sense to me to choose shale grey to match the shed colour, but are concerned it will look blue/brown. Our living area steps our from the brick and will be all weatherboard extending to blackbutt (dark stain) deck. We like the tuabams silver service as a slightly lighter shade also. What are your thoughts for a shale grey, or any other colour recommendations? We have been trying to decide on the perfect grey to paint our dark brown exterior bricks. We have a colorbond zinc roof, and colorbond woodland grey fence, our window frames are white and we have stained timber posts. Was thinking colorbond shale grey or taubmans grey bonnet for the bricks and woodland grey for the gutters? Our house gets baked from the sun at the front from around 10am till evening. We don’t want a flat grey but also don’t want blue tone. I would like to paint our two story rendered townhouse white. What white do you think is best without being too stark. Our roof is charcoal tiles,our balcony railings are black and I have lots of greenery around. Please delete my surname from my recent question to you, I didnt realise I had included it, oops ! My husband and I are building our dream weatherboard home. We have chosen to have monument colorbond for the roof and vivid white for trims, windows, posts of verandahs etc. I have sample pots of tranquil retreat and timeless grey (full and half-strength). I feel the tranquil retreat throws too much blue/lilac. So it is timeless grey but just not sure whether to go full, half-strength or have a look at quarter-strength. Also, what colour should we do fascia/guttering and garage door in? Was hoping for a lighter garage door but not sure what colorbond colour to use. Any tips or comments would be very grateful. Hi Samantha. I was thrilled to come across this wonderful blog. We will be replacing asbestos sheeting and old concrete tiles with Colourbond on a small flat front 1950s cottage in the Blue Mountains. The house is on the low side of the street, most of the houses in the street are around the 1920s vintage and in various shades of grey. The front of the house faces south and has two large windows with white frames and white shutters in the windows. The western wall has a window on one end. We are wondering about painting the gable a dark colour perhaps the same as the gutters and fascia. We have been agonising over the colour swatch. We feel something a bit out of the box would be exciting but it is a simple structure. Shale Grey for the roof seems to appeal with dark gutters and fascia, maybe in Monument. However the wall colour is proving difficult, Deep Ocean, Basalt or something lighter? I can provide a photo of the house. Any comments will be most welcome. My gosh I’m so happy I found your page. I desperately need help. So we re-clad the rear of our house 2 years ago and it still remains unpainted. Can you tell I’m very indecisive. So the rest of the house is getting re-clad in 2 weeks. The pressure is on to finally find a paint colour for our exterior. The house is a 1960’s open gable weatherboard. We have an extension (flat roof) that is colorbond Woodland Grey. However we are replacing the gable roof which is currently terracotta tiles to colorbond also. It doesn’t necessarily need to be Woodland Grey as we can just change the flushing to the colour we choose (the Woodland Grey cannot be seen due to the flat roof). I’m really concerned about getting the roof colour right. It’s an open gable roof on the sides of the house. So the roof frontage is quiet a large roof. I don’t want the roof to look top heavy. My other concern is the house frontage is west. It’s so bright and glarey in the afternoons. I always liked taupe and beige colours but I’m concerned in the westerly sun it’s going to look yellow. I really don’t like Grey but think it’s my only option. Do you think a any of the following would work been west facing. Dulux Narrow Neck Double, Lyttelton Double or Winter Fog with a Woodland Grey roof? Ready to admit defeat and just use Jasper, which to me looks a little “bronze”, in that it seems to have a green undertone. Hi Samantha, found you website and your astute colour observations. We have a unique holiday house in norther NSW right next to the beach. It has a cottage green colourbond curved roof. We are about to reclad in Hardie plank Linea boards. We are struggling for a colour to match with green and dont like the classic cream combination, We are thinking of a soft grey (Dulux Tranquil Retreat?) with white window trim (and precious silver aluminium frames) which looks OK when we play with it in powerpoint, Can you recommend a grey that will go OK with a cottage green colourbond roof? Any other out of the box ideas? Thank you SO much for your reply…and especially the advice! We are both really thrilled to hear back from you….being newbies at blogs and things…and totally agree with what you have suggested. We realise it is essential to paint large colour test patches on the various aspects of the house because that huge North wall can look a little monolithic, and we don’t want it to loom over the neighbourhood like a dark cloud, nor disappear into a cloud of nothing very much. We had been looking at Dulux Endless Dusk…but having seen your suggestions we like them even better! Will definitely send pics of the completed project! any advice would be amazing. I really liked the look of the colour pallette of the warm grey in different strengths on modern home in this article. Any ideas what colour that was? I too am so pleased to have found your website. We have been waiting eight years to paint our two story weatherboard house as it is currently cream and green. The main issues is that we have have terracotta roof tiles ( which are quite old) and have decided to paint the windows Dulux Vivid White and gutters /eaves Dulux Raku. However, we are really struggling to find a warm grey that is sophisticated and timeless. We are thinking Silkwort or Winter Fog. Although I’m worried Silkwort will come across as too purple in the sun. I was hoping you could give me your opinion on the following house and garage colour scheme. We are building a south facing house with a wrap around verandah and a garage at the rear in South Gippsland, Victoria. We will be using Haymes paint. we are wanting to paint our exterior walls in a light grey ( Silkwort) lexicon comes to mind for doors and windows, I really need help with the roof, gutters and fascia colours? I am hoping to get your advice please. We have bought a bit of an ugly duckling 80’s brick house. The previous owners had the tiled roof repainted black and replaced the gutters and fascia in monument. The windows in the entire house also need to be replaced. We want to lighten the exterior as much as possible without trying to make an older home look too modern or too bland. We we thinking of getting the new window frames in monument also and rendering the home in a lighter colour. The colours I have been looking at are Grey Pebble, Winter Terrace and Calf Skin. We have a new garage door in colorbond chestnut and a merbau feature fence. Any advice would be greatly appreciated.